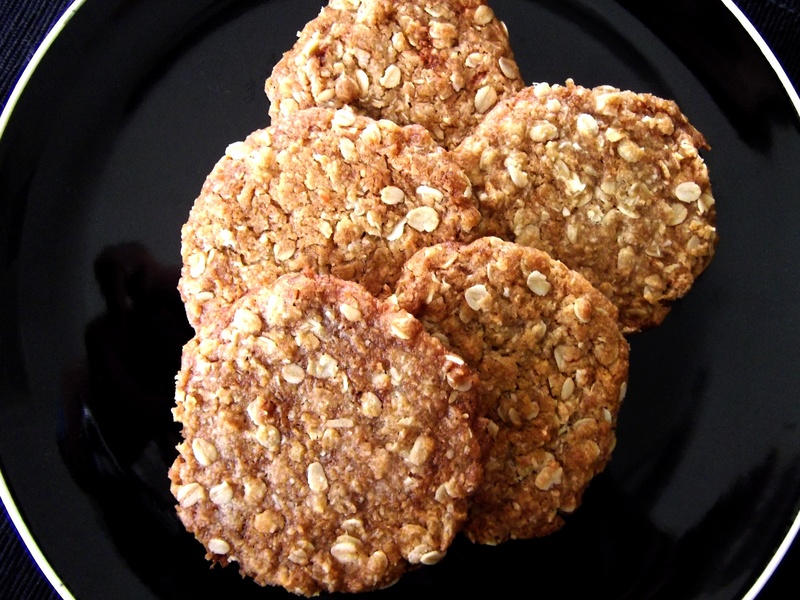 These are a tasty twist on the classic Anzac recipe. If you have an allergy to dairy or egg then these are perfect for you because the extra virgin olive oil is the primary liquid ingredient that holds the mixture together. I always think of olive oil as being a healthier alternative to a slab of butter too. So let’s forget about the sugar and golden syrup that is in these….. 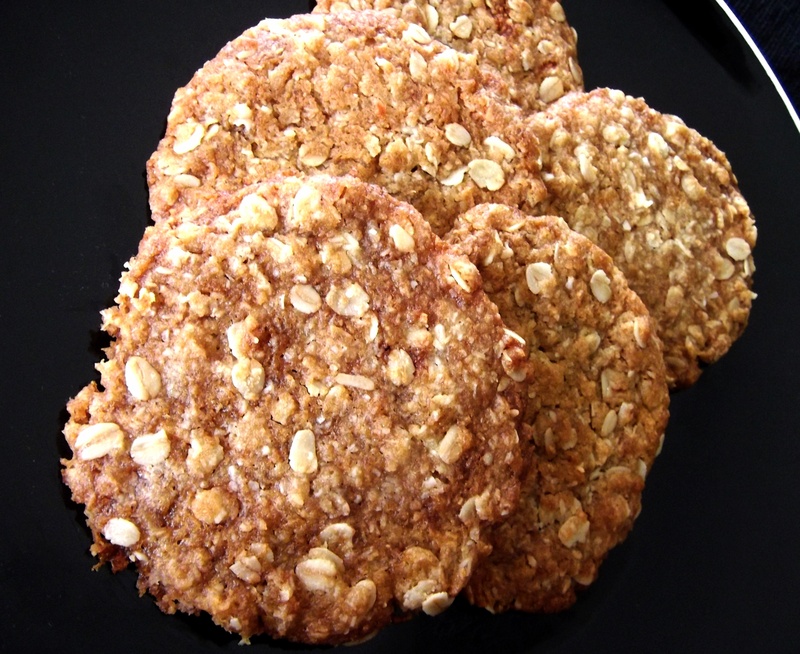 In case you aren’t sure what Anzac biscuits are for, tomorrow (25th April) is Anzac Day. It is the anniversary of the first major military action fought by the Australian and New Zealand forces during the First World War. These biscuits are the traditional snack for the day. 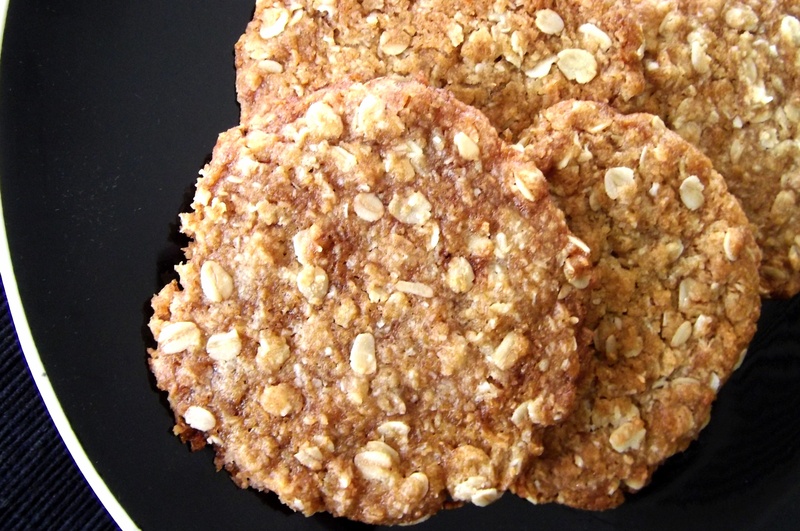 They are deliciously chewy with great flavours from the oats and coconut, not to mention the olive oil. It is important not to use an olive oil with too strong a flavour or it may over-power the biscuits. In the supermarket here the good olive oils are often marked with some kind of a flavour intensity scale, so pick one at the lighter end of the range. I find that they are pretty versatile in the kitchen so you’ll get plenty of use out of the bottle. This recipe actually came from an olive oil advert on the back of one of my recipe magazines! Heat your oven to 180C/160C fan forced/360F. Put the flour, sugar, oats and coconut into a large bowl. Stir to mix and break up any lumps of sugar. In a small jug whisk together the oil, golden syrup, water and bicarb of soda. Pour the liquid into the bowl with the dry ingredients and stir to combine. The mixture should be quite sticky. Form the mixture into small balls and place on the prepared baking trays. Leave a decent amount of space between each because they will spread quite a bit. Bake the biscuits for 8 minutes. Then remove from the oven and use a fork to lightly press down on each biscuit to make them the desired thickness. You can also use the fork to tidy up their shapes if they aren’t quite round. Bake for another 5-7 minutes or until golden brown. Remove from the oven and leave to cool on the trays for 5 minutes. This entry was posted in Baking, Snacks and tagged Anzac, Baking, Biscuits, Coconut, Cookies, Food, Oats, Recipe, Recipes, Snacks. Bookmark the permalink.